The really good news is that it doesn’t take a lot in the way of supplies and materials to be able to paint successfully in watercolor. Watercolor is a tricky medium. Using inferior materials – especially paint, paper and brushes will make it even trickier. So, do yourself a big favor and purchase professional grade paint, Arches 140lb Cold Press paper, and the best synthetic (nylon) brushes you can afford. 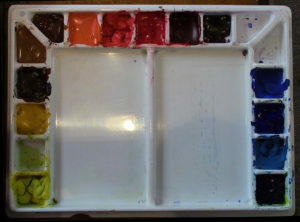 Skimp, if you must, on everything else – palette, sketchbooks, pencils, rags, water containers, and backing boards. Keep It Simple!. Especially if you are just starting out. Working with a limited number of colors from the start will help you develop a sensitive eye for color and lead to exceptional color mixing skills. The best advice I can give about paint is to start with professonal grade paint. The way it works and the way it looks will make the cost worth it. When you are just starting out, it is tempting to pick up a pre-packaged, low-cost set of colors. Resist that temptaion. You will not get the best from this tricky medium or really be able to learn it well using inferior paint. One important, but often overlooked piece of info about the watercolor paint you are purchasing is the Color Index Generic Name or CIGN. Each pigment can be universally identified by its CIGN. Every manufacturer names the colors they sell. These names are descriptive but they are not necessarily comparative. The exact composition of a color with the same name can vary from one manufacturer to another. For instance, there are at least six different formulations of professional grade Permanent Alizarin Crimson among different manufacturers. They all look different and work differently with other colors. Knowing the actual pigment components by their CIGN codes will you avoid unpleasant surprises. The list of suggested basic colors, below, includes the CIGN code for the pigment(s) used to create that particular color. The list includes mostly versions of the primary colors – red, yellow and blue. A palette that consists of only these basics is extremely versatile and will help you develop your ability to both see and accurately mix practically any color you need. A recommended list of colors can vary greatly from one artist to another. My own palette consists mostly of a variety of primary colors. Though seemingly limited, it provides me a tremendous variety of colors for my paintings. I recommend a similar set of primaries for everyone, especially beginners. Below, you’ll find a list of twelve basic colors. Essentially, this is a palette full of primary colors – reds, yellows and blues and a couple useful neutrals. This set of eight colors will serve you very well as you learn and gain experience. There are a cool and warm version of each primary color. It is possible to mix an extremely wide range of color using only this set. You’ll need something to hold the paint and to use for mixing paint. Any large – at least 10” x 12”- sturdy, white plastic palette with a cover will do. Make sure it has large wells for the paint and a large mixing area in the middle. There are many manufacturers that produce good, low-cost plastic palettes that will perform well for many years. A handful quality synthetic or synthetic/natural blend brushes are really all that are needed to do the trick. The most important characteristics in watercolor brushes are water absorption, springiness and, for rounds, coming to a fine point at the tip. Brushes can be made of either synthetic material – usually nylon – as well as natural hair. In general, the natural hair brushes will be the most expensive. While it is nice to have those beautiful natural hair brushes, you can get along with a set of quality nylon brushes. The bristles of nylon brushes can be either white or a golden brown color and are good choices to start with, as they generally combine the best characteristics of natural hair brushes at moderate cost. 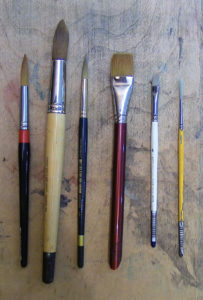 The most commonly used brushes for watercolor painting are rounds and flats. Rounds are brushes that are round at the ferrule (the metal piece that holds the bristles) and are constructed so that they come to a point. There are many good quality brushes on the market. Purchase the best you can afford. Stay away from the low-cost, pre-packaged sets – they are usually inferior. I recommend starting with three rounds, two flats and a rigger. The table below provides a guide to the sizes you’ll need. Stick with brushes from these brands, at least at the start: Escoda, Isabey, Loew-Cornell, Princeton, Raphael, Richeson, Robert Simmons, Royal-Langnickel, Winsor-Newton. Watercolor paper is the one area to NOT try and save money! The one paper I recommend for everyone when they are starting out or still learning to get a handle on watercolor is Arches 140lb Cold Press paper. It is moderately absorbent and will help you manage those fluid washes you should be using to get the best from watercolor. It is great to start on, and will continue to be great for those accomplished works you will create as you progress! Many accomplished watercolor artists use it for most of their work. The best way to minimize the cost is to buy paper by the full sheets (22” x 30”) and cut or tear them to a workable size – 11” x 15” (quarter sheet) or smaller. It is also available in pad and block form. Neither of these is the most cost effective. Watercolor paper needs to be supported while painting. I recommend using a product known as “Gatorboard”. It is thicker version of foamcore board made from plastic materials to prevent warping. It is light, sturdy and durable. 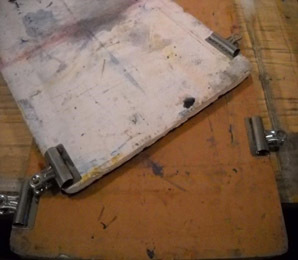 Paper can be taped, clamped or stretched to Gatorboard. If you have a piece of scrap masonite, plywood or luan laying around, you can use that. Just remember that any wooden board needs to be sealed with several coats of varnish before using them as paper supports, or else they will warp. 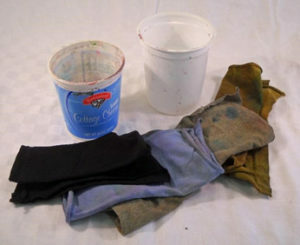 Besides paint, palette, paper and brushes, there are a number of other supplies that will come in handy. A sketchbook or two – one for pencil drawings and sketches, and perhaps, another one for color sketches. These should be at least 9” x 12”. The pencil sketchbook will be useful for drawing and sketching potential subjects along with working out compositions for painting. Almost any sketchbook with plain white paper will do. Hardbound sketchbooks are usually the most expensive. For color sketches, there are lots of choices. Make sure it has at least 90lb paper that is meant for watercolor or watermedia. 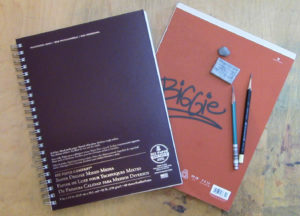 The Bee Paper Aquabee sketchbook is good choice – high quality and reasonably priced. For pencils, you can go with the common #2s that are everywhere. But I recommend using 2B drawing pencils. They are a bit softer than the common #2 and are less likely leave scoring marks on the soft surface of watercolor paper. Also, they are versatile drawing instruments equally able to make light and dark marks, as well as everything in between. You’ll want an eraser. Kneaded erasers – usually gray rectangles – are versatile and will work for both erasing lines on watercolor paper as well as being a valuable tool for drawing. You’ll also need some rags for blotting and cleanup. Paper towels are popular and absorbent but old T-shirts, sheets or bath towels cut into rectangles is the more environmental friendly way to go! I recommend using two water containers – one for clean water and one for dirty rinse water. Again, you can purchase water containers, but it’s easier on the environment if you re-purpose used plastic containers. i just finished the 3 color wheel lessons, but had to sub some of the colors with what I had. I did pretty well with them & your explanations make it easy to grasp the concepts. You mentioned lemon yellow in the videos, but the materials list which I had printed prior to watching the lesson in order to prepare, listed your cool yellow as DaVinci Aureolin, & I only had Holbein Aureolin PYs 154, 150, & 175, which did not match at all so I chose my DS Hansa Yell. Lt. PY 3. Watching the videos, I see the DS Lemon Yellow you were using has a definite green tone to it. Mine did produce a nice bright yellow green mix W/ Fr. Ultra Blue & w/Phthalo Blue (gr. shade), but I wonder if I should get the Lemon. I do have Hol. Lemon Yell. PY 37 & that does look a bit greener. I also substituted Hol. New Gamboge for Cad Yell Med. I have older WN Cad yellows, but prefer not to use the Cad colors. I will also use up my Cobalt Blue, then probably try a Cobalt Blue Hue & may try the newer cad hues. For my warm red, I chose DS Quin Coral. I also have DaV. Quin Red PR 209 & Hol. Scarlet Lake PO 73, PR 254, PV19, if you think either would be a better red. I no longer buy Winsor & Newton pigments because they contain ox gall, as I am a vegetarian, which also means no Arches or paper brands using animal sizing. I was able to find several cotton papers to suit my needs. I do have some old Arches & some others purchased long ago before I knew about sizing issue, so when they’re gone that will be it. i am looking forward to more projects, especially the bird series. I hope to do the Chikadee this wk! Thank you! Hi Peggy – I’m glad you are enjoying and finding the videos helpful. And thanks for pointing out the difference between the the basic materials list and what I’ve been using in the recent videos. DaVinci Aureolin is indeed on the basic list, while I’ve lately been using Daniel Smith Lemon Yellow. Hansa Yellow is a good substitute – and is kind of a traditional color as well. There’ really no need to run out and get the exact paint I’m using if you are getting good results with what you already have. BTW, I started using Lemon Yellow on the advice of a friend, but find that I like the DaVinci Aureolin better, and will be switching back to that when my supply of DS Lemon is gone. New Gamboge is usually a good substitute for Cadmium Yellow. The difficulty, not only with yellows but with most of the “warmer” colors is that most versions are actually cool – meaning they have some blue in them. I’m also trying to move away from the Cadmiums (and Cobalts). I’ve picked up DaVinci Indian Yellow which is a transparent warm yellow and a pretty good substitute for Cad Yellow Medium. It doesn’t have the opacity and tinting strength, but still works pretty well. Both Daniel Smith and Holbein make a Permanent Yellow Deep, which are similar. Don’t bother with Cobalt Blue Hue – it will be PB29, which is Ultramarine Blue. The unfortunate reality with both Cadmium and Cobalt based colors is that there is really no good substitute that really provides the same color with the same unique characteristics of each. With the reds – I’m not familiar with Quin Coral or Quin Red. But, in general, Quin colors tend to be cool rather than warm. PR209 is a red pigment that is definetly cool – it is the single pigment used in WN Permanent Alizarin Crimson and in Daniel Smith Quin Burnt Scarlet – both are cool reds. The word Scarlet is also usually a tip off that it is a cool red, although I’m not familiar with Holbein Scarlet Lake so can’t say for sure. Also the word “lake” usually means that the color has a staining quality. One the things on my to do list is to create a chart of recommended colors as well as a list of good substitutes. I think it will be a download rather than a video. Either way, I’ve reached out to manufacturers asking for samples. Hopefully, I’ll get a good response. That I know of, Holbein is the only manufacturer that does not use ox gall in its paint. Perhaps others have switched as well, but Holbein is free of it for sure. I’m not familiar with the different types of sizing for papers. I’ll look into that. If you are not using animal products, obviously stay away from sable, ox and squirrel hair brushes. The next Winter Bird is the Cardinal – in fact I’m filming it, or at least part of it, today. Hi Tony, Just read your reply with all the info – thanks so much! I had been checking the comments on the color wheel videos, but not the set up one! I was at Arlene’s, my local (Albany) art supply store yesterday and had staff open up the DS Cobalt Blue and the Cobalt hue tubes so I could see the how close they were, and boy, what a BIG difference! The hue version was very dark- not even close! I do have a few old animal-derived brushes from my (oil and acrylic) decorative painting days (1980s-early 2000s) and I occasionally use the hog bristle ones, but I now only buy synthetics. Also, sepia and pigments containing the black from charred animal bones are a no-no for me. I think it’s PBk6 that is the non-animal one.